Server rack shelves have been specifically designed to fit in 19" server cabinets. The racks are easily adjustable with some shelves vented to allow for airflow, helping to cool any equipment down that might be prone to over-heating. Heavy duty shelves are also available and are able to hold more weight than a cantilever shelf. A shelf is measured by using rack units (U or RU) and is defined as 44.5 mm (1.75 in). A server rack is typically 42U high with the equipment being anywhere between 1U and 6U high. As cabling is also an issue in server racks, the shelves have been designed to enable cable management. 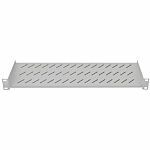 The types of rack mount shelves include fixed vented rack mount, rack mount modem, cantilever, telescopic cantilever, half racks and side mounting trays. Server rack shelves can quite often be mounted via the front or the rear of the cabinet. The racks are easily moved either by sliding the shelves into various slots in the cabinet or, if they are fixed shelves, mounted using brackets and cage nuts. The width of the rack can be adjusted to accommodate the server. Server rack accessories can also be rack mounted and include drawers designed to hold manuals or cables.